Interested in bringing Matthew Arnold to speak at your parish or event? Book him now through The Catholic Speakers Association! The story of the Christian Crusades to the Holy Land is one of the most fascinating events of medieval history – and raises many serious questions today. There is probably no institution in the history of man more unjustly maligned than the Catholic Church-and no more powerful rhetorical device than the distortion of the facts regarding the Crusades. 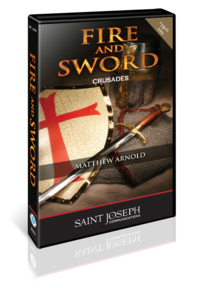 In the fascinating new DVD, Fire and Sword: The Crusades, Catholic convert and EWTN Radio personality Matt Arnold pits the common accusations about these historical events against the findings of modern scholarship and what he uncovers will amaze you! In this informative presentation, he reveals that those who have a stake in keeping the myths and misconceptions alive are actively obscuring the best scholarship from both religious and secular historians. Fire and Sword begins with an introduction to many virtually unknown facts about the Middle Ages, and exposes the common misconceptions about the period. Through the works of many leading medieval scholars Matt demonstrates that, "If we judge the past by its fruits, we'll soon discover that the Middle Ages weren't so dark (and Catholics not so barbaric!) as so-called history suggests." By the year 500, the Christian West was overrun with pagan barbarians and the once mighty Roman Empire was in shambles. The city of Rome had been sacked by Goths and Vandals, her libraries destroyed, and the population devastated. In the centuries that followed, Christendom was further challenged by devastating heresies within the Church and the unexpected rise of a new religion ? Islam. 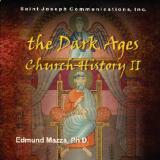 In the second installment of his fascinating series on Church History, Edmund Mazza, Ph.D. brings to life the astounding story of the ?Dark Ages? (c.500 ? 1000) through the lives of the great personalities of the early medieval period. From the Irish monks who preserved the treasury of Latin literature to Pope Gregory the Great whose influence on the liturgy is still experienced at Holy Mass it was through the courage and faith of Catholic Saints that Christendom survived to pave the way for the glorious Age of Faith that would be known as the High Middle Ages. Order now and discover important insights that are particularly relevant for Catholics today who are called to engage in meaningful dialogue with an increasingly hostile world.